Head coach Matt Goode has set his sights on getting Banbury Bulls into the top three by the end of the year. But Goode knows that will depend on other clubs dropping points on top of Bulls winning every game in Wadworth 6X South West One East. Bulls are up to fifth in the table following their third straight success. 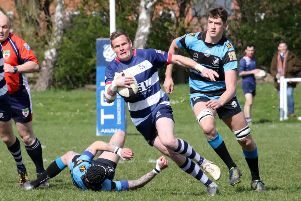 With second-placed Royal Wootton Bassett inflicting a second defeat of the season on Marlborough, it means Bulls are five points off third place. That position is occupied jointly by Marlborough and Old Centralians who Bulls meet in the return fixtures in the second half of the campaign. Goode said: “We’ll see what happens between now and Christmas. A top three spot would be great if the games go our way until the end of the year, we’ll be pushing all the way to do that. Captain Ian Isham and Pete Boulton will be among those players coming back into the selection picture for Saturday’s trip to Trowbridge. Goode added: “I think with the rotation we did last week and some boys coming back we’ll be finishing the year pretty fresh. “Even though our front three did well on Saturday, we’ll have more players available this weekend. “We don’t know anything about Trowbridge. Our focus has been on Swindon, we’ll switch to Trowbridge now and see what we can work on for them.